The Kaito KA390 may not be a hot 'DX' machine, but it fits the bill as an affordable and efficient radio for camping and emergency use. Because it has an analog display, and operates from 3 D batteries (not included), it has an amazingly long run time .... up to 300 hours (depending on volume)! 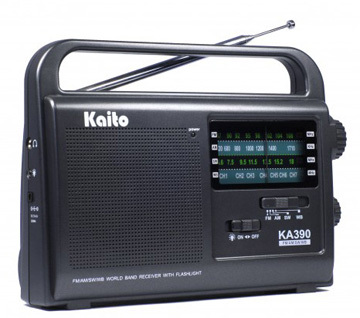 It gives you the four important bands: AM 520-1710 kHz, FM 87-108 MHz, NOAA weather channels 1 through 7 and shortwave from 7 to 19 MHz. This covers the the six major international broadcast bands: 41 meters (7.1-7.35 MHz), 31 meters (9.4-9.9 MHz), 25 meters (11.8-12.1 MHz), 22 meters (13.55-13.85 MHz), 19 meters 15.1-15.8 MHz) and 16 meters (17.45-17.9 MHz). The left panel features an LED light source, 3.5mm earphone jack and 6 VDC [+] input jack. There is an LED power lamp on the front panel. 7.7 x 6 x 2.2 inches One year limited manufacturer's warranty.